The Barbican Centre in The City of London is one of the largest performing arts centres in Europe. Final year student, Charlotte, explains why it’s a great place for creative students to visit. As an arts student, studying in London creates a huge range of opportunities for performing, attending events and finding new music in a variety of different venues, many of these offering discounted student prices. 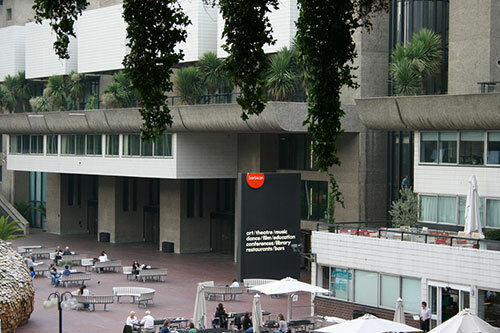 The Barbican Centre, one of the closest large venues to City University is no exception. Home to the London Symphony Orchestra, The Barbican Centre is a crucial venue for any arts student. It is also the venue for City, University of London graduations, so it’s a good place to go and explore before the big day! The Barbican Centre is located around Barbican Station (surprise, surprise) and is a mere 15 minute walk from City University. The Barbican Centre is ‘Europe's largest multi-arts and conference venue presenting a diverse range of art, music, theatre, dance, film and creative learning events’. It provides all of these mediums simultaneously, often with multiple events happening on the same evening. The Barbican Centre’s programme spans across genres, with classical and jazz music, along with arthouse and mainstream cinema. This makes it a great place to pick out events both for extra curricular activity and for conducting research. The Young Barbican scheme allows 14-25 year olds to purchase tickets from as little as five pounds, with a number of seats on each event designated for Young Barbican members. This makes the venue affordable on a student budget, so you can make the most of the art and culture London has to offer. My most recent visit to The Barbican Centre was to see ‘Ask Your Mama: 12 Moods for Jazz’ as part of the Langston Hughes project. Langston Hughes is one of the most prominent African-American poets of the 20th century, having been at the forefront of the Harlem renaissance. Hughes is arguably the creator of ‘jazz poetry’ a written form that developed parallel to the jazz age in the early twentieth century, this is a particular writing style I had not heard of before seeing the piece performed live. ‘Ask Your Mama: 12 Moods for Jazz’ explores notions of African-American identity through the Harlem renaissance to the birth of Bebop. The piece had been dedicated to Louis Armstrong in 1960, but was not performed until after Langston Hughes’ death in 1967. The performance at The Barbican Centre was the first run to include rapper and actor Ice T and the Ron McGurdy quartet. Ron McGurdy himself acted as musical director and trumpeter, occasionally speaking alongside Ice T.
This piece, among many others, demonstrates the diversity of events put on at the Barbican, which draws from the best of music, film and theatre worldwide. These events often offer an insight into musical history, and are sometimes organised into month long events dedicated to an artist, place or time. As an arts student, The Barbican Centre offers a unique opportunity to explore aspects of ethnomusicology, sounds and visual media and performance simultaneously. Whatever your specific interest, it is a great resource for research and enjoyment.